Heat 2 tbsp. oil in large sauté pan over medium heat. Add onion and cook until they become golden. Add carrots, place lid on pan, and cook, stirring often, until they are crisp tender. While carrots are starting, steam lightly the broccoli and green beans to crisp tender. Add snow pea, squash, green beans to other vegetables, cooking for a few more minutes until snow peas are done. Remove vegetables and keep warm. Add remaining coconut oil to pan and add curry powder. Cook until the mixture starts to darken and very fragrant, a minute or two at the most. Slowly add coconut milk and whisk well, until oil mixture is well incorporated. Add shrimp and cook for 5 minutes or until shrimp are done. Salt and pepper to taste. 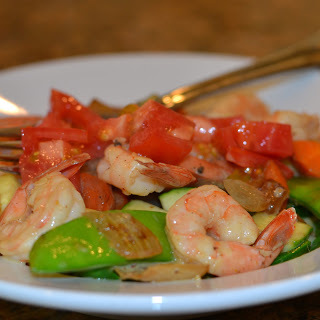 Serve shrimp curry over vegetables and finish with diced tomatoes. 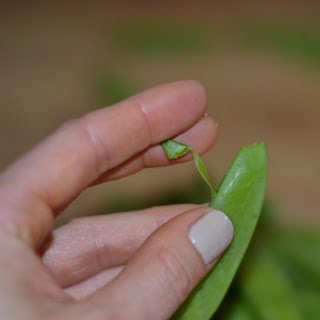 One of my biggest pet peeves is laziness when it comes to snow peas. Please, please take out the vein, on both sides, so that is it not hard to bite through. Takes a few extra minutes to do it, it is worth your time.